Posted Mar 29, 2019 by Eds. The Notes section of this article has been modified to clarify the referenced sources. —Eds. At this time, the GND can still be described as radical in several important respects. The first concerns its potential scale and scope for action. Referring to the $700 billion American Recovery and Reinvestment Act (ARRA), Politico’s Michael Grunwald has written, “The [GND] idea sounds as radical and new as Ocasio-Cortez herself, [but] it’s been done once before, and just a decade ago: President Barack Obama signed a prototype Green New Deal into law in February 2009, pouring an unprecedented $90 billion into clean electricity, renewable fuels, advanced batteries, energy efficiency, a smarter grid and a slew of other green initiatives.”14 This is Obama-fawning revisionism at its worst. The $90 billion allocated to green investments, spread over several years, was not enough to transform anything. By contrast, FDR’s Depression-era government committed 13% of U.S. Gross Domestic Product (GDP) to direct public interventions. The ARRA committed just 2%.15 The GND that has been submitted to Congress is a much bigger animal altogether. It calls for a complete overhaul of energy, transportation, food and agriculture, etc. This will require massive investments. Third, the latest GND resolution does not call for carbon pricing. If it can be sustained, this exclusion will amount to a massive policy breakthrough, because it flies in the face of almost 30 years of investor-focused climate policy. At the level of the UN, the G20, the World Bank, the World Economic Forum, etc., the now-20-year-old call for an “effective global price on carbon” continues ad nauseum. But the policy holds no promise of seriously impeding the rise of emissions. In 2017 just 15% of global GHGs were subjected to a price; in three-quarters of cases where a price on carbon exists, it was no more than $10 per ton—a trivial “cost of doing business,” and easily passed on to consumers in any case. The Global Commission on Economy and Climate recently noted that carbon prices “are still too low to have meaningful impact” and that a global price of $40-80 per ton by 2020 is needed to be consistent with the Paris targets.17 Those who dismiss the GND as unrealistic fantasy would be well advised to acknowledge the proven fantasy of a global carbon price. It is simply not going to happen. The GND discussion could assign this rusted up “market mechanism” to the scrap yard, opening the space needed to debate and develop global climate policy that can genuinely meet the challenge. The fourth path-breaking aspect of the GND is how it might be paid for. Ocasio-Cortez and her supporters maintain that, “The majority of financing of the Plan shall be accomplished by the federal government, using a combination of the Federal Reserve, a new public bank or system of regional and specialized public banks.”18 Economists supportive of the GND have noted how “quantitative easing” was used by the Federal Reserve to carry out necessary spending in times of emergency, as in the bailout of the banks in 2008. 19The same can be done to finance programs to protect our collective future. Ocasio-Cortez’s proposals, as well as those of Sanders, reflect the rising influence of Modern Monetary Theory (or MMT) in policy debates.20 MMT economists like Stephanie Kelton argue that, as a currency-issuing government, the U.S. could technically finance the GND directly through deficit spending, without issuing treasury bonds or private sector borrowing. According to Kelton, “Anything that is technically feasible is financially affordable… The federal government can spend money on public priorities without raising revenue, and it won’t wreck the nation’s economy to do so.”21 According to MMT theorist William Mitchell, “It is often overlooked that the current system allows private banks to create most of the digital money in circulation through loans, which create deposits and liquidity that can be spent.”22 If private banks can “create liquidity,” the government can—and should—do the same. Lastly, the GND is potentially transformative in that it paves the way for public control over sectors of the economy that the government substantially funds. The original draft GND Resolution noted, “There is also a space for the government to take an equity role in projects, as several government and government-affiliated institutions already do.”23 This is hardly a call to take over the commanding heights of the capitalist system, but it is a clear sign that the prevailing neoliberal notion that public money must be used to “unlock” private investment is, at long last, being challenged. There is more to MMT that can be explained here, but—if combined with a commitment to extend public ownership—the stage is set for the GND to evolve beyond a list of ambitious goals to become a suite of transformative government-led strategic economic interventions. ↩ DRAFT TEXT FOR PROPOSED ADDENDUM TO HOUSE RULES FOR 116TH CONGRESS OF THE UNITED STATES. ↩ DRAFT TEXT FOR PROPOSED ADDENDUM TO HOUSE RULES FOR 116TH CONGRESS. ↩ This, of course, was the main message of Naomi Klein’s immensely significant book on the radicalizing potential of the climate crisis, This Changes Everything, published in 2014. ↩ “Senator Markey and Rep. Ocasio-Cortez Introduce Green New Deal Resolution,” February 7, 2019. ↩ “Merkley, Sanders, Markey, Booker Introduce Landmark Legislation to Transition United States to 100% Clean and Renewable Energy,” April 27, 2017. ↩ The bill (HR 3671) was submitted by Representatives Tulsi Gabbard (HI), Barbara Lee (CA), Jamie Raskin (MD), Nanette Diaz Barragan (CA), Ted Lieu (CA), Jan Schakowsky(IL), and Keith Ellison (MN). ↩ Alexander C. Kaufman, “Democratic National Committee Backtracks On Its Ban Of Fossil Fuel Donations,” Huffington Post, August 10, 2018. ↩ Kate Aronoff, “The Green New Deal Takes Its First Congressional Baby Step, as Pelosi Mocks ‘Green Dream or Whatever’,” The Intercept, February 7 2019. ↩ Andrew Stewart, “Sorry Democrats, the Green Party Came Up With the Green New Deal!” Counterpunch, November 29, 2018. ↩ Climate Justice Alliance, “A Green New Deal Must Be Rooted in a Just Transition for Workers and Communities Most Impacted by Climate Change,” December 10, 2018. ↩ Peter Z. Grossman, “Opinion: Green New Deal destined for failure,” Detroit News, February 2, 2019. ↩ Terry O’Sullivan, “LIUNA on the Green New Deal,” February 7, 2019. ↩ Michael Grunwald, “The Trouble With the ‘Green New Deal’,” January 15, 2019. ↩ Sean Sweeney, Kylie Benton-Connell and Lara Skinner, “TUED Working Paper #4: Power to the People,” June 2015. ↩ UNEP, The Emissions Gap Report 2017. ↩ TUED, “When ‘Green’ Doesn’t ‘Grow’: Facing Up to the Failure of For-Profit Climate Policy,” December 3, 2018. ↩ Carla Skandier, “Quantitative Easing for the Planet,” The Next Step Project, August 30, 2018. ↩ Peter Coy and Katia Dmitrieva, “Alexandria Ocasio-Cortez Is the Darling of the Left, Nightmare of the Right,” Bloomberg Businessweek, January 17, 2019. 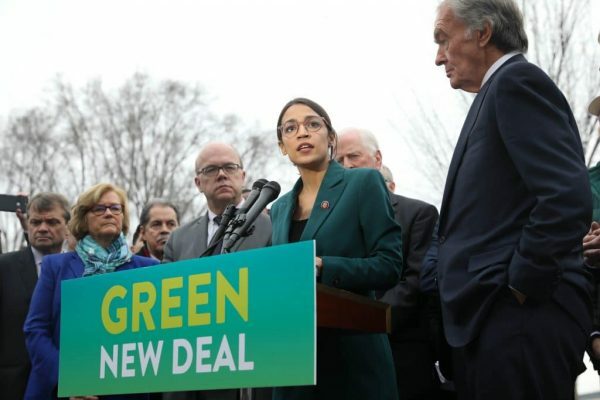 ↩ Stephanie Kelton, Andres Bernal, and Greg Carlock, Guest Writers, “We Can Pay For A Green New Deal,” November 30, 2018. ↩ See William Mitchell, Reclaiming the State: A Progressive Vision of Sovereignty for a Post-Neoliberal World Pluto Press.